Gift of Blood is the gift of life, donate blood save life – said Sj. Pratap Jena, Hon’ble Minister Health & F.W, Law, Odisha and Chairman, Working Committee, IRCS-OSB while inaugurating the State level celebration of World Blood Donors Day as Chief Guest at Red Cross Bhavan, Bhubaneswar. He encouraged the youth mass to donate and promote blood donation in order to lessen gap of donation and requirement of blood of the state. He offered his deep gratitude to the blood donors as their kind gift for human being. “Blood donation is a symbol of love and affection to the person who needs blood. As a token of humanity and love for almighty, we should donate our best the” blood” to save precious life” said Dr. Ajit Kumar Mishra, Project Director, OSACS as the guest of honor. Dr. Gyanabrata Mohanty, Honorary Secretary, IRCS-OSB welcome all the dignitaries on this occasion and said Blood is the vital force to sustenance. It is collected at the camps, preserves in blood banks and used in hospitals. In each stage transparency and quality should be maintained and qualitative and quantitative safe blood should be provided. This day was celebrated in order to felicitate Voluntary Blood donors and Blood Donation Camp organisers. 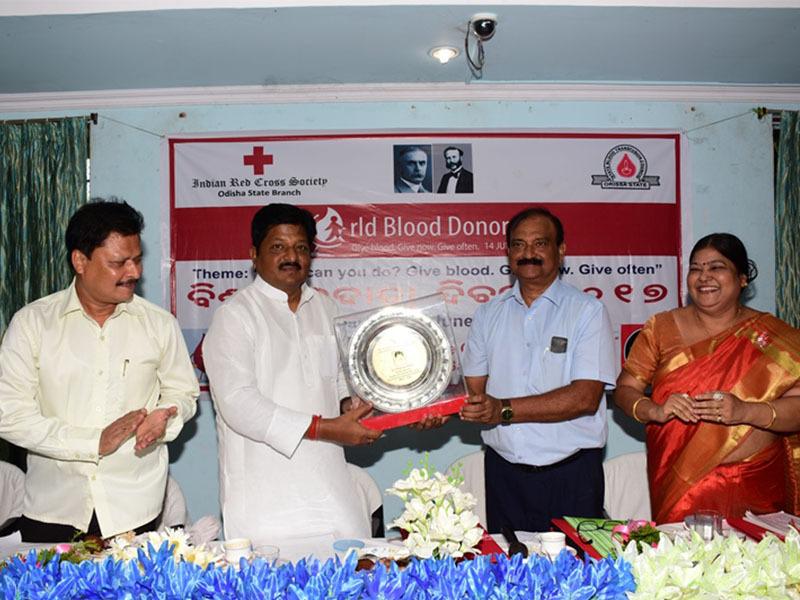 On this occasion 57 nos of awards were given to the Voluntary Blood donors by the Chief Guest. Beside a blood donation camp was organized where 43 units of blood has been collected during the day.